Latino energy literally pours on to the Walnut Street Theatre stage as a solo hip-hop riff builds into a contagiously exciting dance number that sets just about every member of the lithe and lively In the Heights cast waving arms and wriggling torsos while their feet assay the nimble steps of cha-cha, rhumba, samba, and myriad rhythms and movements that come to us from Puerto Rico, Mexico, the Dominican Republic, Cuba and other destinations south. Michelle Gaudette’s involving choreography sets a fast and engaging pace for a show in which the opening dance is one of many showstoppers, each of which features the in the Heights ensemble proving something every fan of the Broadway musical knows, that there is no group of people more talented, versatile, and flexible than the musical theater dancer (with the possible exception of musical theater orchestras). Into the Heights is Lin-Manuel Miranda’s valentine to the Washington Heights barrio where he spent his childhood and where he took in all the daily sights and sounds of street life as it occurs in Upper Manhattan, in the shadow of one of New York City’s most important gateways, the George Washington Bridge (GWB, as natives call it). In the Heights began life in 1999 when Miranda, age 19, submitted it to Wesleyan University faculty as his sophomore project. The show was deemed good enough to rate a production on Wesleyan’s main stage. Miranda honed and honed his piece, usually taking the lead role of Usnavi, the Dominican immigrant whose parents named him after a U.S. Navy freighter, and earned first-class productions in 2007 and a Broadway outing in 2008, when the show garnered its Tony for Best Musical. Miranda was in charge of the music. He knew the sounds he wanted, particularly those that surround Usnavi’s clever rap soliloquies. He also knows the happy, celebratory approach he wanted to take towards the denizens of Washington Heights, the new Americans from several Central and South American lands, las bonitas banderas from which figure in several of Gaudette’s production numbers. Needing help with the book, Miranda enlisted Philadelphian Queria Alegria Hudes, who earned fame from In the Heights but has parlayed that into a career as a regularly produced playwright. I was going to call Hudes a budding playwright, but her 2012 Pulitzer Prize for Water by the Spoonful, to be seen later this season at the Arden Theatre, says she is established. I look with eager anticipation to that production, and to other works by Lin-Manuel Miranda. In the Heights makes that much of an impression. Bruce Lumpkin, the director of the Walnut production, does an excellent job at pacing the show so Gaudette’s high-powered dances can be interlaced with intimate, smaller-scale vignettes that tell the story of Usnavi and his neighbors. These stories are fairly typical, dealing mostly with individual hopes, dreams, and disappointments that have been dramatized before, but benefit from the rapport the characters establish and the immediate affection you develop for them. In my more waggish moments, I’ve described In the Heights as Cats with more appealing characters, more heart, more cohesiveness, and no interminably boring dance numbers. My reason for the Cats reference is the structure Miranda and Hudes give their piece. Big number is followed by revelatory solo piece that leads into a big number that, again, is succeeded by a solo turn. Different from Cats, you never get tired of the progression. Especially at the Walnut, where In the Heights flows evenly and congenially with no dead spots and no characters who are not interesting in their own right. To keep things light, Miranda only brushes on crime or vandalism and other negative aspects of life in a New York barrio. His purpose is to accentuate the spirit of the people and the sense of constant movement you get anywhere in New York, but particularly in the busier sections of Washington Heights. 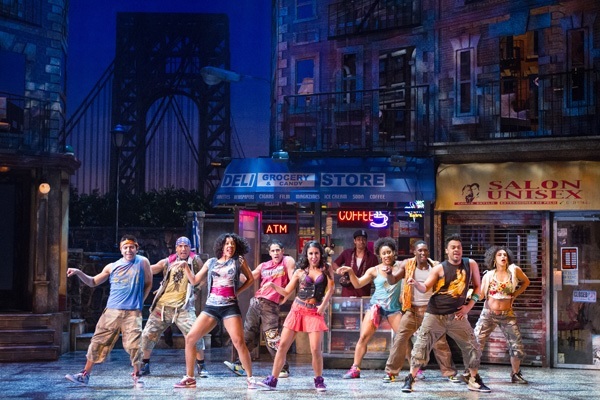 The positive take on urban life, the dance numbers of a quality rarely seen on regional stages, the focus that makes you care deeply about several characters, and the general tone of people pursuing happiness make In the Heights one big smile. The Walnut production keeps that smile broad and constant. Many of the characters in the show have aspirations. Usnavi is content with running a small coffee shop and convenience store, but he would to own a bar on a Dominican beach. Vanessa, one of three beauticians who sing a smart song, “No Me Diga,” with its chorus of “Tell me something I don’t know,” wants to move downtown where she thinks life is more refined and more doors will open for her. Nina, the neighborhood’s golden child, needs to break the news that she did poorly in courses and lost her scholarship to Stanford. Benny wants to open a business. Nina’s parents, Kevin and Camelia, look forward to making enough money to retire and sell theirs. Claudia, known to all in the barrio as Abuela (grandmother), is the heart of Washington Heights and wants to see all of her “children” be happy and prosperous. As said earlier, the aspirations are not unusual, but the Walnut cast presents them in a way that make you care about each individual, especially Usnavi and his orphaned cousin, Sonny, the brat of the block. Lumpkin and Gaudette bring out the best in In the Heights. Their production is crisp while remaining affectionate. Nothing plays false, and you welcome even the most worn of plot cliches because Lumpkin and his actors have made them so personal and engaging. The memory will be of the dance numbers and their ebullience. The Walnut has set a new standard in local choreography with this production. Perry Young is perfect in his focal performance of Usnvai. Young exudes Usnavi’s love for the barrio while conveying his longings for both that bar in the Dominican and Vanessa, the beautician who, alone among the characters, always gets her coffee free. Young sings Miranda’s hip-hop lyrics with clarity and texture. This is important because these numbers introduce you to the lead character and the Washington Heights mise en scene. Matthew J, Harris is lovable as the mischievous, juvenile Sonny, who is young enough to flirt with women without being smacked and teenager enough to want to spend his day prowling the barrio instead of helping Usnavi in their store. Rayanne Gonzales embodies the warmth and radiating love of Abuela Claudia. More than playing the basics of her character, Gonzales endows her performance with nuances and touches that remind me of the grandparental figures in my life and in the neighborhoods where I was raised. Like most of the In the Heights cast, Gonzales has a grand solo number, and the actress, already holding the audience in the palm of her hand, insures she will never be forgotten as she goes through her paces with the Broadway savvy of an experienced pro. Camelia is not the most completely drawn part, but Kimberly S. Fairbanks plays it with authenticity that brings her character into stronger focus and makes her as sympathetic as Camelia balances being stern with being reasonable. Donnie Hammond, as Daniela, the owner of the beauty shop, is a joy every time she takes the stage. Hammond obviously relishes her role as the barrio gossip and mother hen to her two employees. She embodies the lively urban woman who has a fast tongue and likes to have fun but brooks no nonsense. Julia Hunter is a warm Nina whose dilemma makes you feel for her. Rhett George lets you see the highs and lows of Benny’s emotions and, in the second act the depth of his feelings about Nina. Maria Konstantinidis, as Carla, the beautician whose life moves the plot the least, is actress enough to build her thankless part into one that seems integral to the show. Gizel Jimenez, as Vanessa, is properly dramatic and vulnerable as both a woman at a crossroad and as someone who works to figure out her feelings toward Usnavi, who is attracted to her while Vanessa thinks she might be too sharp for him. Danny Bolero is strong as Kevin, and his voice may be the best and truest among a cast of able singers. I enjoyed the bright turn by Carlos Lopez, as the piragua (ice cone) man, and the smooth urban performance of Ceasar F. Barajas as the local delinquent and graffiti artist. In the Heights runs through Sunday, October 20 at the Walnut Street Theatre, 9th and Walnut Streets, in Philadelphia. Show times are 8 p.m. Tuesday through Saturday, 2 p.m. Thursday, Saturday, and Sunday, and 7 p.m. Sunday. 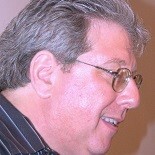 Tickets range from $75 to $10 and can be ordered by calling 215-574-3550 or going online to www.walnutstreettheatre.org. Photo: Perry Young and Ensemble of In the Heights at Walnut Street Theatre. Photo by Mark Garvin. This entry was posted on September 14, 2013 by nzoren in Theater Reviews and tagged In The Heights, musical, Theater.